You can feel the love. You see it in the young girl’s smile. You hear it in the hockey player’s voice. It’s a friendship and bond that means the world to Matt Duchene. The ease in which they interact with one another is instantly noticeable. There’s always plenty of laughter whenever five-year-old Haven Anderson and Duchene are together. It was during the 2014-15 NHL season when they first met through a Hockey Fights Cancer skate. The Colorado forward was immediately drawn to the petite blonde with the firecracker personality, the kid who is battling Stage 4 neuroblastoma, a cancer that typically affects children who are five years of age and younger. Haven, who was diagnosed with the disease when she was two, had an immediate impact on Duchene. They see each other as often as Duchene’s hectic hockey schedule allows for. 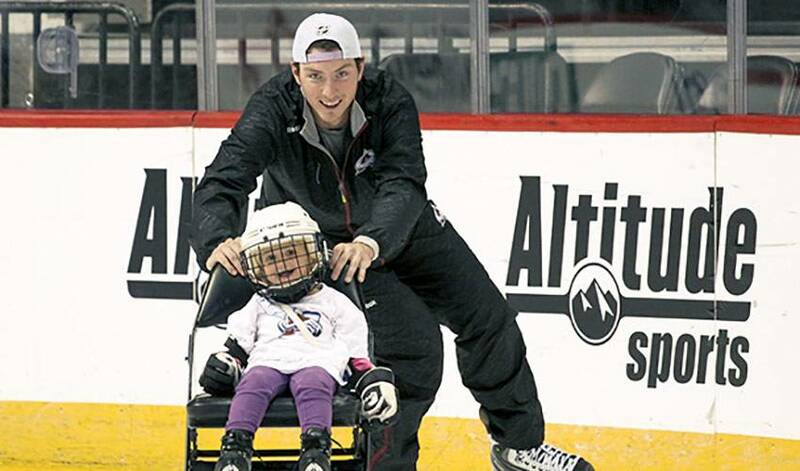 The 25-year-old centre, in his seventh NHL season, walked the runway with Haven, who attends a few Colorado games a month (wearing her Duchene jersey), at his team’s charity fashion show event in March. Haven’s friendship continues to inspire Duchene. Prior to Colorado’s recent Stadium Series home tilt against Detroit, CCM made a new pair of skates for the Haliburton, Ontario native that he wore during the game. The skates were then put up for auction with bids open until March 4. The money raised will go to CureSearch for Children’s Cancer, a foundation that raises funds and awareness for childhood cancer patients. In support of CureSearch, the NHLPA & NHL's Hockey Fights Cancer initiative and the Colorado Avalanche will jointly match the winning bid up to $5,000. Duchene will also make a personal contribution. Haven, accompanied by her father and brothers, was in the stands for the outdoor contest played at Coors Field, home to Major League Baseball’s Colorado Rockies. One look at Duchene’s Twitter account, which features several pictures of himself and Haven, as well as his earnest commitment to pediatric cancer initiatives, are heartfelt examples of how Haven has influenced his life. As the race for the playoffs intensifies, the pressure to perform increasing with each game, the expectation of elevated performance heightened, Duchene will be dialed-in on delivering for the Avalanche. Through it all, he won’t, however, forget his No. 1 fan and good friend, someone Duchene believes has the heart of a hockey player. Because that’s what any good teammate and friend would do.